Happy Monday and welcome to part one of my two part head to toe black series on my blog today. I'd be lying if I said I was adventurous when it came to colors in my wardrobe. I'm a neutral girl, through and through. The only pops of color that you'll find are some of my floral spring and summer dresses and even then, the base for those are black or white or some sort of neutral color. As a creature of habit, I figured I should embrace said pattern in my wardrobe choices! I first tried out jumpsuits last summer. 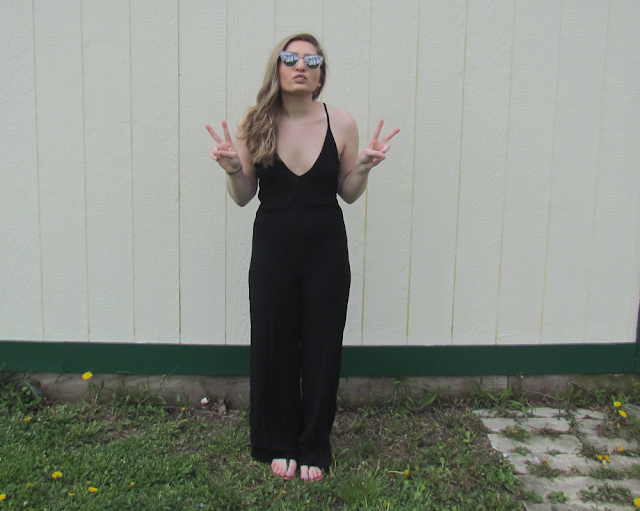 Oddly enough, my other jumpsuit is also black. But it's also strapless, chiffon and a little more high maintenance to wear given the whole lack of straps situation. But this jumpsuit from Tobi is the jumpsuit I've had in my mind every time I've gone to get dressed over the summer. 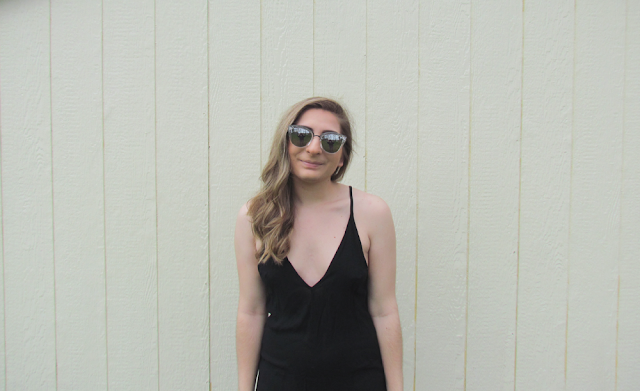 Do you know how easy it is to just slip on a black dress or jumpsuit and call it a day? Too easy. I lacked the ease of a casual jumpsuit like this one and cannot wait to start romping around in it. As you can see, it does have a very deep V in the front, which I haven't found the right bra to wear with it yet. I generally don't wear bras in general because #Constricting, am I right? I am not all that embarrassed to admit that if you see me wearing this in the summer, I'm probably enjoying yet another bra free day. I'm sure if you don't have the joy of getting to avoid bra wearing, there's something out there that wouldn't show terribly bad. Even in, they make plenty of bralettes with really pretty straps and backs so that even if they do peek out, they're super cute! 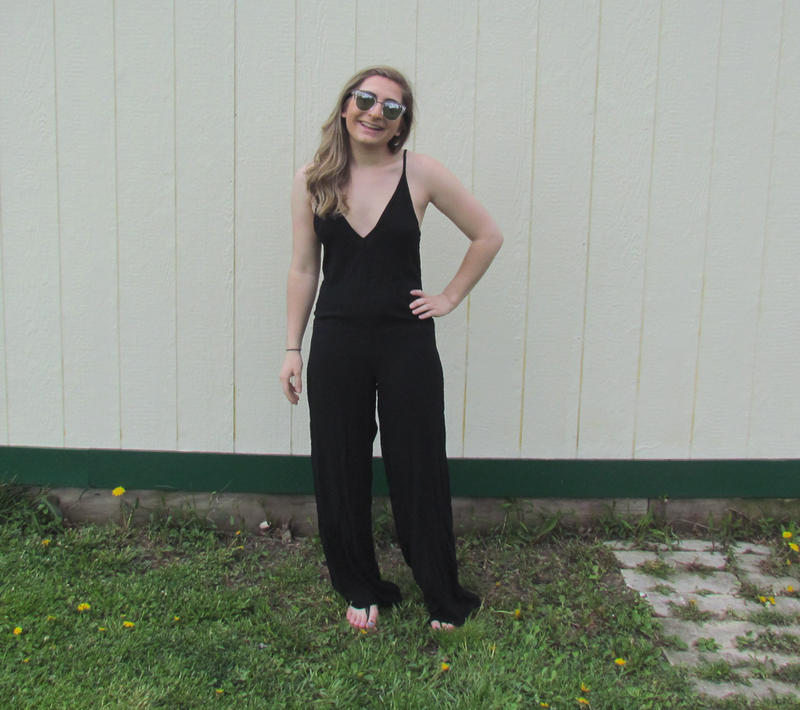 So, am I going to be wearing this extremely comfortable and breathable jumpsuit all summer? Mmm, there's a pretty good chance that this is my "I have two seconds to get ready and need to look cute STAT" outfit. Check out more from Tobi: Dresses, Rompers, Maxi Dresses, Jumpsuits, Skirts, Bodysuits.